Have you felt intimidated by those Pilates machines for a while now? Or maybe, it just seems “way too intense” or involves a little too much flexibility for you. Don’t let fear hold you back! Pilates is the ultimate low-impact, total body, functional workout that simultaneously stretches and strengthens. Whether you do it in a group or private setting, the benefits are noticeable - longer, leaner muscles, a more defined core, legs and thighs, better balance, better flexibility and better posture. As a Pilates teacher, I’ve heard every reason/excuse in the book as to why people aren’t trying Pilates. 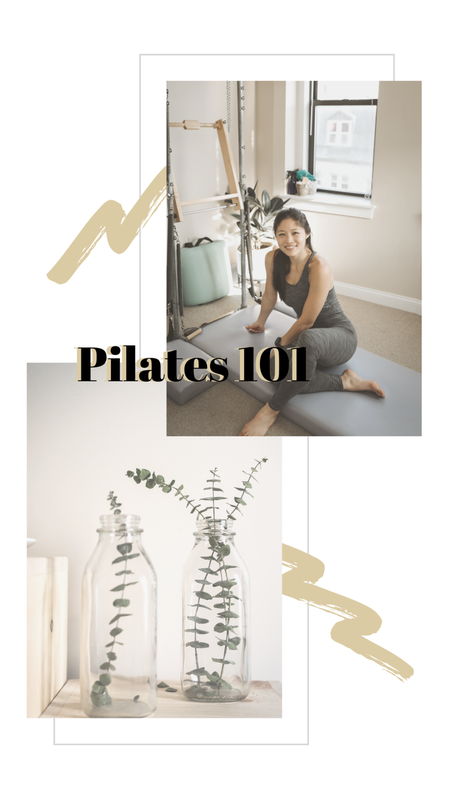 Here’s your guide to starting Pilates for the first time to help guide you to your first class! Firstly, when thinking about a Pilates class or type of class, you’ll have to decide between group or private instruction. The main things to take into consideration: whether you’re injured, level of attention you want, and budget. Group Classes: If you’re a healthy, uninjured body, definitely incorporate group classes into your routine! Reformer classes: These classes are usually under 12 people as space is limited by the number of reformers that can fit in a room. You get some attention from the teacher as s/he will adjust the machine and introduce you to it if you’re new. Expect maybe a few personal corrections throughout class and to pay about double what you’d pay for a mat class ($35/40). Mat classes: These classes vary in size - anywhere from 5-50 people. I’d say, on average you’ll be in a class that’s between 10-20 but, with more popular teachers you can be looking upwards of 30 people per class. You get the least amount of hands on correction and individual attention here but you get the benefit of a high likelihood of sweating, flowing and continuous movement. Expect this to be your cheapest option ($20). A private class can take place anywhere - at your home, at a home studio, at a fully equipped studio, or even just on the mat. You’ll get the most bang for your buck at a studio that has some equipment, rather than just the mat. You’ll get 100% attention, hands on corrections and specific workouts. I’d recommend anyone with special conditions (injuries, pregnancy etc) to start here. Expect to pay between $75-100 per session. Now, there’s a world where you do all of these things together but, I’d suggest picking one type first to start with, and then adding more into your routine. Now that you know what you’re looking for, how do you choose a studio? There’s a lot of Pilates jargon so, finding the right studio can be confusing. I’d like to also say, there’s no shame in switching studios. We don’t take offense to it - do what feels right for you! The obvious factors here that I won’t talk about - convenience of location and availability on services like Class Pass. Take these into consideration, of course! Is the studio “fully equipped”? This just means it has all the equipment that exists in the system. This is most important if you’re looking for private training. I’d say, at minimum, make sure they have a reformer and a cadillac or tower. Chairs, barrels and other apparatus are (really) nice to have. Now, studios will also sometimes say what brand their equipment is. I know that’s not common across any other fitness class. Now, instructors usually like to work on equipment they were trained on so, everyone has a different opinion on the “best.” Here’s my advice, try a few different brands if you can and find what works best for you. If you don’t have the luxury of that, pick which equipment looks sturdiest, well maintained and the most “expensive” based off of pictures (ie not low to the ground, lots of plastic). This won’t work 100% of the time but, the reality is, you’re paying a lot of $$ and will want to feel like the equipment you’re on is worth it! Every instructor has a different individual style but, many come from a few large training programs - Stott, Basi, Power Pilates, Classical/Authentic/Romana’s Pilates, Balanced Body. As long as they are comprehensively certified, you can feel confident they know their stuff. Look for instructors who’ve completed at least a 400 hour certification program. One way you can find out an instructor’s style is to check out their social media for videos. Often, they’ll post videos of themselves moving or teaching and you can get snippets of their personality and style there. If you’re doing privates, pick which studio you go to based off your instructor. At the end of the day, it doesn’t matter where it is as long as s/he is an amazing instructor. Number of classes on the schedule? The availability of instructors and classes is a big deal breaker. Make sure they enough classes or appointment times to accommodate your schedule. A simple website check or email will do the trick! If you’re doing group classes, pick which studio you go to based off of the studio, not necessarily an individual instructor. If you’re looking for group classes, look for qualities in the studio as a whole first - is the front desk friendly? is the vibe peaceful or upbeat? is there a shower and free towels? is there a water fountain? do you like the decor? Follow these rules and you’ll be good: anything tight (ish) and anything seamless (avoid zippers so you can avoid damaging equipment). Keep your hair up and out of your face (there’s some moves where you go upside down or to the side) - a high pony or a low braid works great. Avoid tying hair up in the middle of your head as it gets in the way when you lay down. Don’t expect to sweat a ton - so you can totally pull out your full on athleisure. Usually, women wear matching sets (think Outdoor Voices), a tank/sports bras and leggings and maybe a long sleeved layer to stay warm at the beginning of class. Wear a normal top (anything technical or cotton, usually in a short sleeve), paired with long pants or a pair of long tights underneath shorts. Your legs will be up in the air, so you just make sure you feel comfortable. Avoid zippers (so no running shorts with a lot of zippers at the waistband/sides) for the most comfort. If you’re a sweaty guy, just wear deodorant and a technical top, and you should be fine! At the beginning of class, get there 5-10 minutes early and choose your equipment (just place your h2o bottle by your reformer and sit on it) or spot for your mat. Wait for the teacher to get the class started, s/he will introduce themselves, and the equipment. Expect the teacher to ask if you’re new, if you have any injuries and to give you an intro to the equipment or class. Regardless of a mat or reformer class, most teachers incorporate various props (balls, poles, magic circles, weights) so, expect to switch between a few props throughout class. It’s nothing crazy and your teacher will tell you what to do with them. Listen closely to your teacher for cues. Expect to use your mind to help you get the most out of each workout. Your teacher might give you metaphors like (move your legs like they’re moving through molasses) that require you to use a little imagination. At the end of class, students usually clap or say thank you to the teacher and then get ready to exit the studio. Feel free to ask questions to the teacher - we love those - even about what other classes you should take. As much as you can but, realistically twice a week. You’ll start to see results more quickly if you incorporate Pilates twice a week. Not only will you see definition but, you’ll feel how it changes how you move, sit and live life. You’ll feel longer, have better posture and move more consciously in the gym/on the bike/on the road. My best advice is if you’re really nervous to try private Pilates for the first time. You’ll be in a safe 1:1 situation where it is totally fine to be a little silly, off balance and to try new things. If that’s not in your wheel house, I’d suggest taking a mat Pilates class first and then progressing onto a reformer class after 5-7 classes. When you do choose to start reformer Pilates, find a beginner class and make sure to let the instructor know you’re new. A good instructor will tell you what the parts of the reformer are and where all your body parts go throughout class. You should feel 100% led as to where everything goes! Again, if you’re very nervous about this, private Pilates is the way to go. You’ll have 1:1 attention and none of the awkwardness that may be attached to being the only guy in the room. If you choose to do group classes, the reality is you will be a minority in the room. But! don’t let that steer you away. Pilates is a challenging workout. My best advice? Tunnel vision yourself into the workout and ignore the rest of the room. This is something you’ll build up to. Find a beginner’s Pilates class. Like anything good in life, you have to work for success. Keep working at it, and you’ll start to improve! I hope this guide was helpful to all of you and helps you get over any fears of trying Pilates for the first time. I know trying anything new can be so scary. If you have any other fears/questions regarding trying Pilates for the first time, feel free to message me on Instagram (@fitwithchristie) or comment below and I’ll address them!